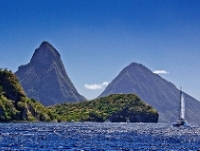 The Pitons - two volcanic plugs that stand like sentinels on the headland outside the St Lucian town of Soufriere - are not only UNESCO World Heritage Sites, but provide active visitors with a glorious opportunity to do some hiking in what are uniquely picturesque surrounds. Gros Piton, with an elevation of about 2,500 feet (770m), is the more popular to climb, as it is not as steep at Petit Piton, and boasts a richer variety of plant and animal life as well as superior views from its summit. The trail that leads up Gros Piton begins at an elevation of about 600 feet (180m), and ascends quite sharply through dense tropical vegetation, broken here and there by cool caves and rocky outcrops that provide outstanding views of Petit Piton rising from the expanse of the Caribbean Sea below. The climb takes about four or five hours in all, and can be undertaken by fit visitors with little or no mountaineering experience. Local guides, trained in emergency medical procedures, are available for hire and will enrich your hike by pointing out interesting flora and fauna along the way.